Consumer Price Index- April 2018. 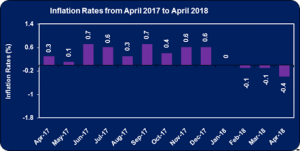 The consumer price index for the month of April 2018 declined for the third consecutive month, resulting in an inflation rate of -0.4%, according to The Statistical Institute of Jamaica (STATIN). The Consumer Price Index for the month moved to 247.0 relative to the 248.1 reported for March 2018. This decline was largely attributed to the movement in the index for the division ‘Housing, Water, Electricity, Gas and Other Fuels’ which declined by 4.3%. Inflation within the Greater Kingston Metropolitan Area, Other Urban Centres and Rural Areas all registered negative movements in their index, declining by 0.3%, 0.4% and 0.5% respectively. ‘Housing, Water, Electricity, Gas and Other Fuels’ division recorded a decline of 4.3% in its index for April 2018. This was a result of the group ‘Electricity, Gas and Other Fuels’ decreasing 8.0% following an increase of 5.5% in the month of March 2018. According to STATIN, this movement was due to the “reduction on the rates for electricity.” In contrast, increases in the water and sewage rates resulted in the group ‘Water Supply and Miscellaneous Services Related to the Dwelling’ to increase by 0.7 %. Lastly, the index for the other group ‘Rentals for Housing’ recorded a 0.1% increase, while ‘Maintenance and Repair of Dwellings’ recorded a negligible movement. The index for the ‘Food and Non-Alcoholic Beverages’ division recorded a negligible movement in its index for April 2018, following a 1.0% decline in March 2018. This resulted from the movements within the ‘Food’ and ‘Non Alcoholic Beverages’ group. Within the ‘Food’ group, the class ‘Vegetables and Starchy Foods’ fell 0.2% which was influenced by a 0.4% fall in the sub-class ‘Vegetables’. According to STATIN, this was as a result of “the prices for some produce such as tomato, carrot and cabbage continued to fall.” This was however offset by the upward movement in the sub-class ‘Starch Foods’ by 0.5%. Within the ‘Non-Alcoholic Beverages’ group the class ‘Coffee, Tea, and Cocoa’ and ‘Mineral Waters, Soft Drinks, Fruit and Vegetable Juices’ recorded an increase of 0.1%. The division ‘Health’, ‘Restaurants and Accommodation Services’ and ‘Miscellaneous Goods and Services’ all grew by 0.1% for April 2018. The movement in the index ‘Health’, this was as a result of “upward movements in the cost for ‘Health Services’. The movement in the index “‘Restaurants and Accommodation Services’ was mainly “as a result of higher prices for meals consumed away from home” while ‘Miscellaneous Goods and Services’ grew due to the “increase in the cost for some grooming services”. The division ‘Transport’ also climbed by 0.8% in its index for April 2018. According to STATIN, this was as a result of the “increased prices for petrol and its related products”. Notably, the other divisions ‘Alcoholic Beverages and Tobacco’, ‘Communication’, ‘Education’, and ‘Recreation and Culture’ all recorded a negligible movement for March 2018.